Entry by Suou on Sun Jul 24 17:11:43 2011. Even if they are redheaded twins, the still can't beat Hikaru and Kaoru! ^ no matter how much I love anime, it will NEVER beat books and literature. never. Fred and George beat Hikaru and Kaoru anytime. Can't we pretend they're both the Hitachiins and the Weasleys at the same time? I can imagine these two as the Hitachiins, actually. All you have to do is squint, remove the freckes, change the hairstyle and the eye color or pretend the Hitachiin twins are cosplaying as the Weasleys. OMG They are amazing! I want to give them a cuddle - soo cuute! ^ it wasn't a comparation between real people and anime people, it was a comparation between literature/books and anime. And literature/books will always be better than any anime. Of course, that's only for intellectual, intelligent people. ^ save your (intelligence) for someone who actually cares, never was interested in literature, never will . ANIME FOREVAAH~!!! :D Hikaru and Kaoru > Fred and Geoge! ^ Can't we just say Hikaru and Kaoru = Fred and George? All of them are redheads anyway. And have the same personalities. 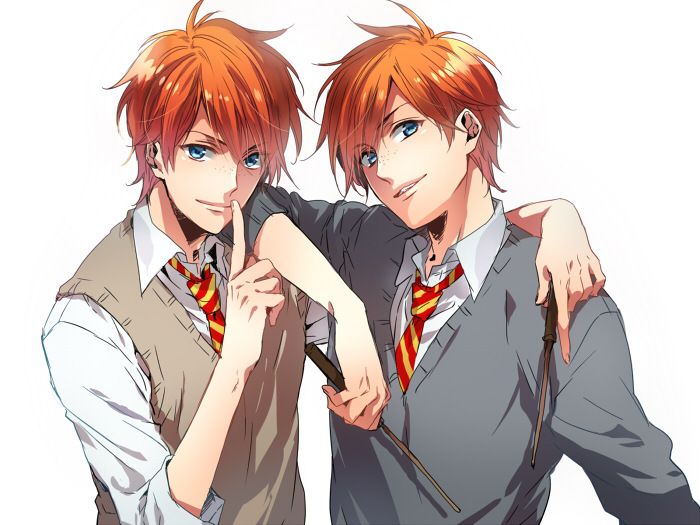 I'm a rabid fan of Hikaru and Kaoru but this picture is about the weasley twins so can we just be rational and focus on what's actually supposed to be focused about? i love Harry Potter .. don't be so - .. ******* !!!! LOVE THESE TWO TO DEATH. Ouran usually tries to make them hot, while seeing the weasleys like this, it's like a treat, since we don't imagine them or see them this hot in the book or movies. Further proof that Harry Potter needs an anime adaptation.